BID LIKE MAD until 11PM sharp tonight! You REALLY don’t have much time. The bidding wars are escalating rapidly. JOIN the FRAY! Please help AYS meet the CHALLENGE. REMEMBER: a generous donor will give AYS a big gift of $2,000 if we reach $8,500. We have less than $900 to go!!! AND only a few minutes to make it happen, folks. UNTIL TONIGHT at 11PM SHARP. Do it NOW, bargain hunters! JUST ADDED! Gourmet Dinner for 6 with RIANNE BUIS – this went for a ton of $$ last year! 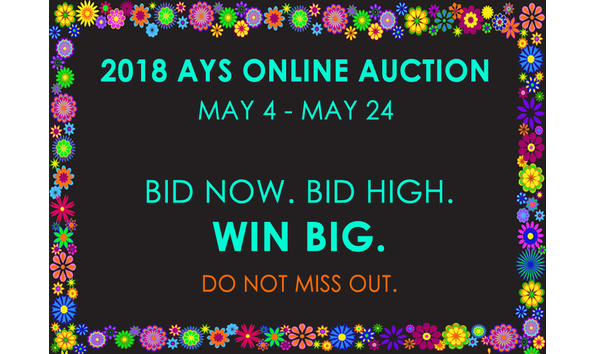 Bid now and it may be yours.